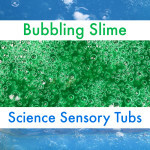 This swamp slime sensory tub bubbles for hours and hours — ours was still going the next day! My son and I had the best time creating and playing with it. That amazes me, because I was never able to get him to play with slime before. But if anything was going to convince him to try a slime activity, I knew it would be this one. When we play Star Wars, his favorite stuffed animal — Meerkat — is always Yoda, and I make my son laugh by having Meerkat/Yoda go on and on about how much he loves his swamp. I’m so happy that Mary Catherine from Fun-a-Day! and I were inspired to make Star Wars slime! Asia from Fun at Home with Kids sparked the idea in a conversation we had when she was holding her awesome Slime Week. 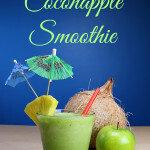 And now there’s another super fun kind of sensory play that my son is excited about doing! 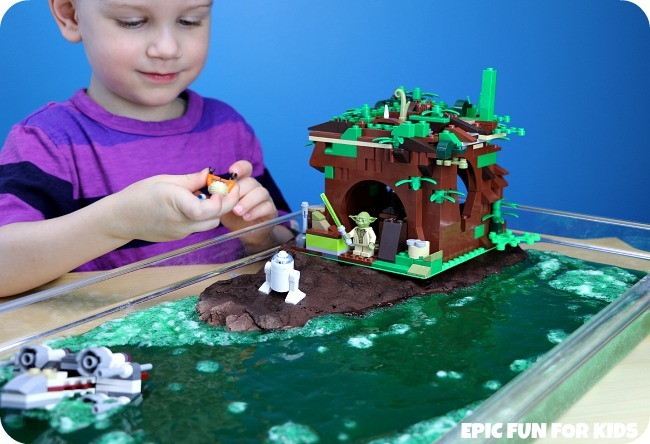 Our next sensory tub is going to have to be Fun-a-Day’s amazing Lego Star Wars Molten Lava Slime for Kids. My son has been asking to make red slime next ever since he heard about it! 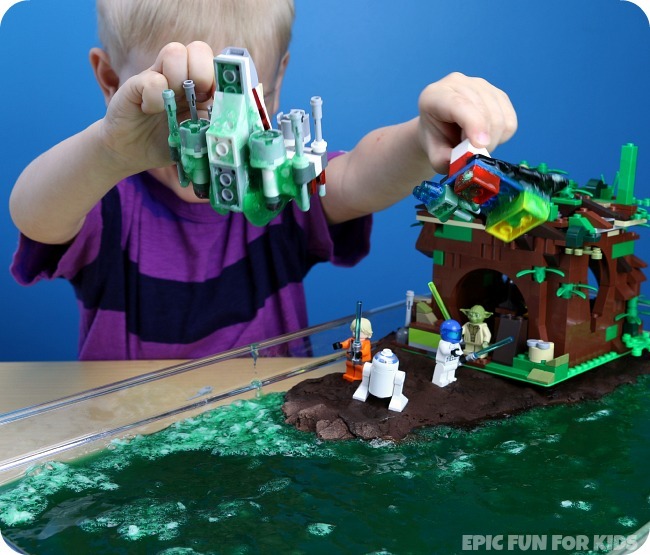 First, let’s watch my kiddo demonstrate how we made and played with our swamp small world — you have to see how the slime bubbles! — and then I’ll tell you everything you need to know to make your own. Bubbling Slime: We used about four batches of our bubbling slime recipe in the swamp, tinted with a lot of green food coloring plus a few drops of red to make the color “swampier.” Go easy on the red, though. A little goes a long way! 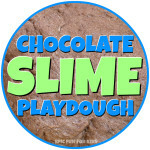 Chocolate Slime Playdough: We made five batches of our chocolate slime playdough recipe to create the land for Yoda’s hut to sit on. Star Wars figures: We used our Yoda, Luke, and R2-D2 mini figures, and my son also added his beloved Wedge Antilles mini figure from the 2006 X-wing set. Another option would be the Angry Birds Star Wars figures (I would avoid using the Telepods figures for this, considering how easy it is to scratch the QR codes on the bottoms of them as it is). 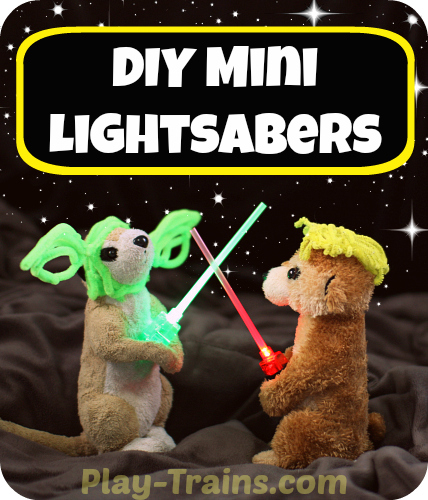 Or you could laminate some Star Wars stickers with a thermal laminator or clear contact paper. 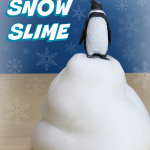 Just make sure that whatever toys you use won’t be harmed by getting wet or by the acidic vinegar in the slime, and don’t have any working parts that the slime could sneak deep inside where it can’t be cleaned out. A toy X-wing: Ours is a Lego Star Wars 75032 X-wing Fighter from the Microfighters line of cute little Lego Star Wars ships and vehicles. 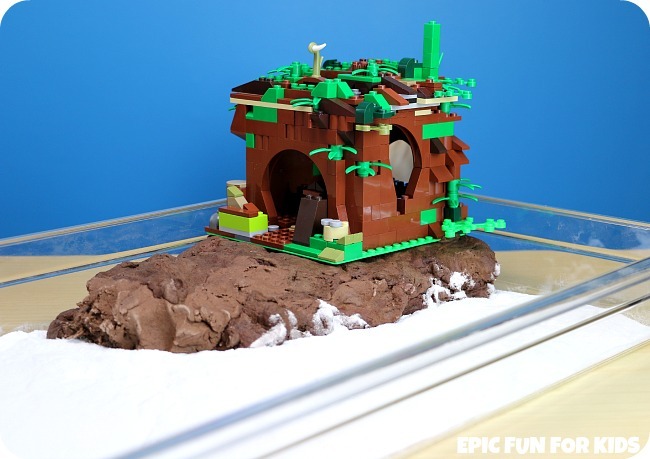 Lego bricks to build scenery: We searched through our big tub of Lego to find all of the brown and green pieces we could. Fortunately, we recently got a ton of the leafy green bamboo-like ones in a Pick-a-Brick haul from our local Lego Store. 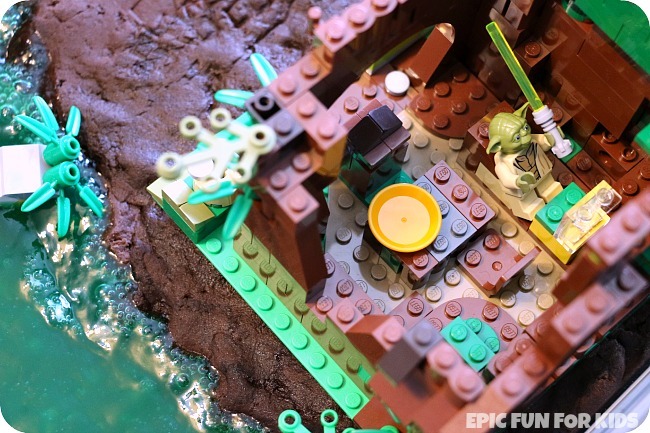 First, we took all the brown and green Lego bricks we’d found and built Yoda’s hut together. We had a lot of fun putting lots of detail into ours — there’s a picture of the interior near the end of the post — but the hut doesn’t need to be anything fancy! I think it’s a nice touch, though, to have something representing the hut. Then we pressed our chocolate slime playdough into one corner of the tub to make land for the hut to rest on. My son was very insistent that there also be plenty of room for the characters to practice lightsaber battles on, so make sure you make enough playdough for that, too. We set the hut on top of the land, and then spread a layer of baking soda over the bottom of the tub. Finally, we poured in a big bowl of the bubbling slime…and boy did it bubble! 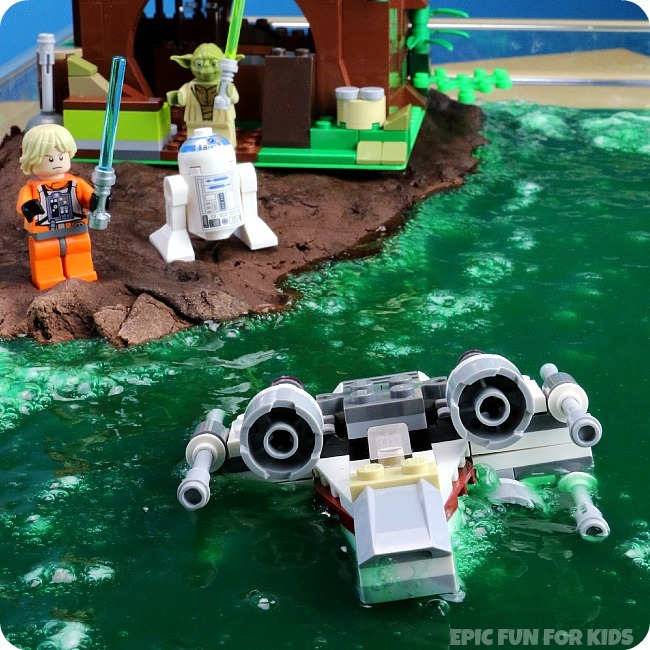 Now, my son hasn’t seen the Star Wars movies yet, but he has a basic understanding of what happens on Dagobah: Luke and R2-D2 crash land the X-wing in the swamp, Yoda trains Luke in the ways of the Jedi, Luke tries and then fails to raise the X-wing from the swamp with the Force, and then Yoda raises it for him. And that’s the storyline he wanted to play out first. 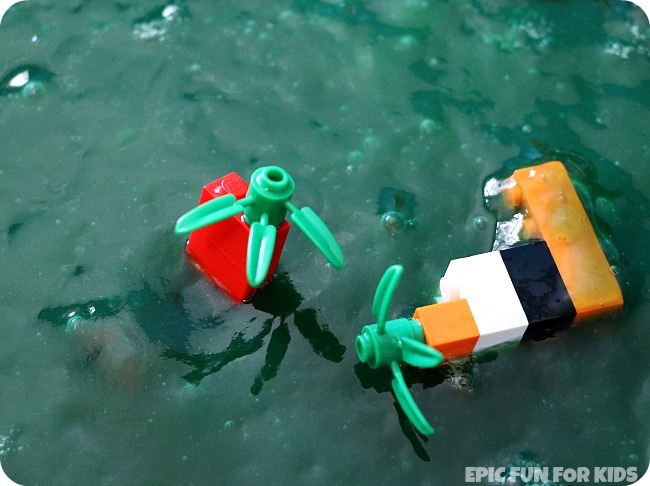 He loved that slime had covered the X-wing with “swamp” when he used the “Force” to lift it out of the water! Unlike the movie, they were both successful in lifting their ships out of the swamp all by themselves. Simultaneously, even. Next, my son ran off to his room without explanation and came back with bricks to make his new idea: “swamp plants.” I thought it was cool that he figured out on his own that he’d need to build tall bases for the Lego plants so that they’d stick out above the surface of the swamp. 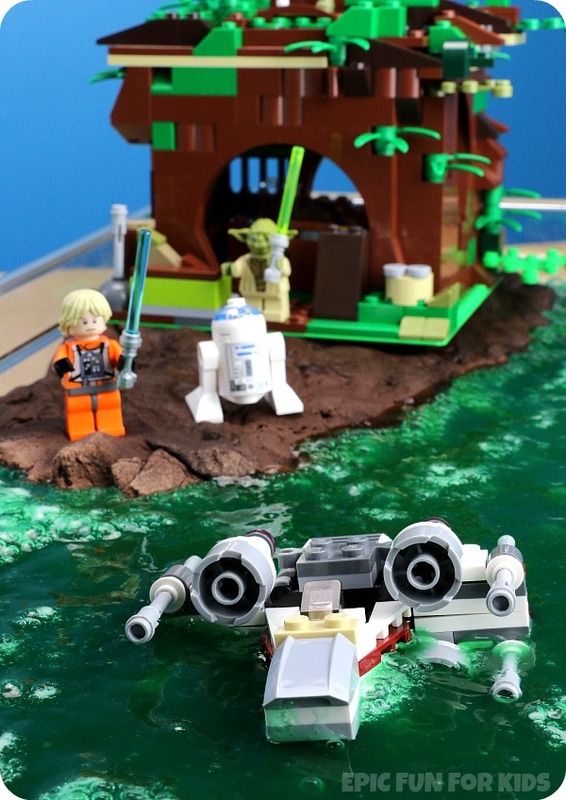 He had built Yoda a swamp boat with a “working anchor” (in addition to building him a spaceship called “The Snake and Frog”), and Yoda would sail out with Luke and Wedge to harvest swamp plants for dinner. 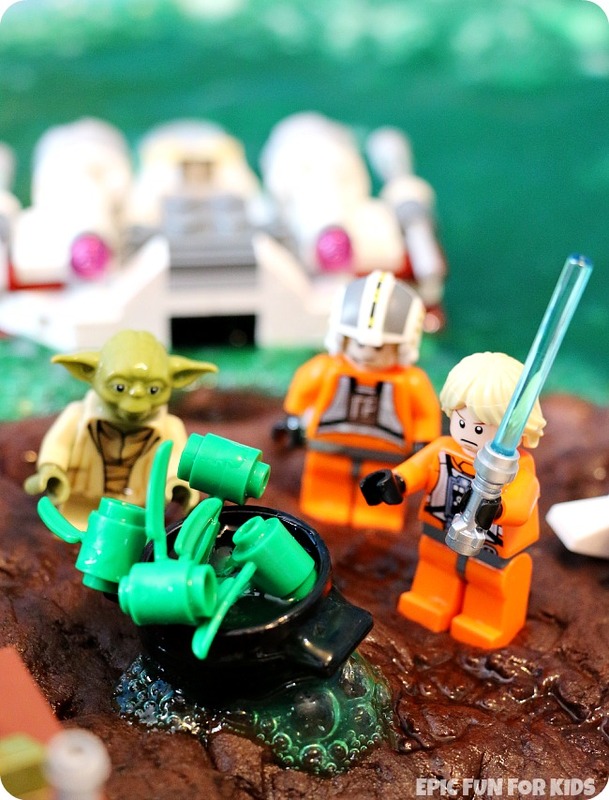 And then — this was my favorite part, so much so that I wiped the slime off my hands and grabbed the camera again — Yoda made swamp stew, a mixture of the bubbling slime and our Lego plants. (When my son’s stuffed meerkat pretends to be Yoda — which is really me pretending to be Meerkat pretending to be Yoda — for some reason he’s always obsessed with swamp food, and trying to get Luke to eat it.) The look on Luke’s mini figure face was perfect. 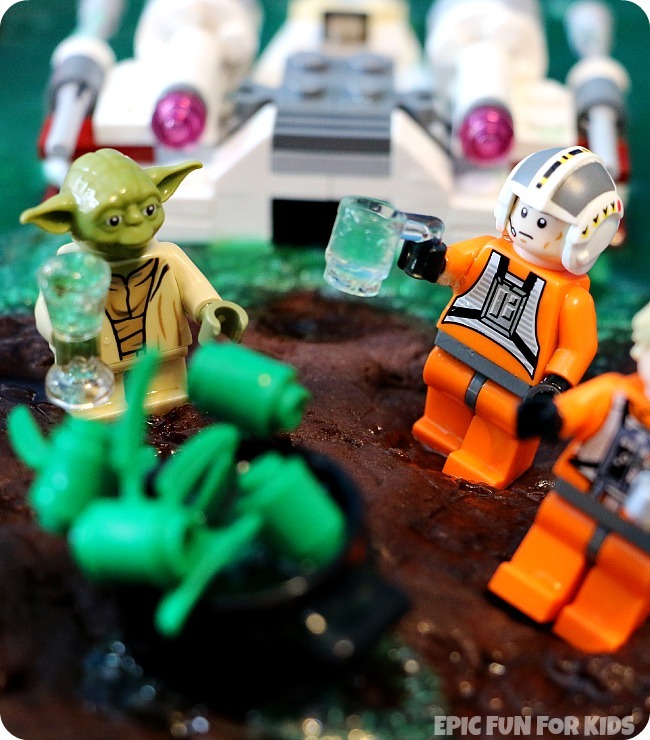 Then Wedge asked Yoda if they were going to drink swamp water, so we found two little Lego cups and filled them with a little bit of swamp. Apparently Wedge is a more adventurous eater than Luke! My son enjoyed washing off the ships over and over, so a lot of the clean up happened while we were playing. Afterwards, we washed the Legos gently with soap and warm water. The slime is water soluble, so it comes off without too much trouble, but I washed them a second time just to make sure there wouldn’t be any lingering slimy stickiness. 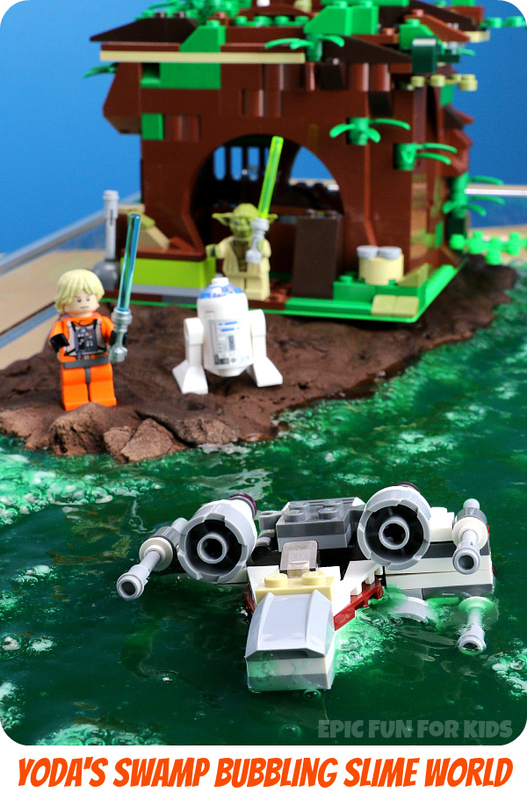 To get the slime out of the little Lego cups and some small gaps on the Lego X-wing, I used a wet Q-tip to get the slime out. To store the sensory tub for more play, remove the hut and cover the tub tightly with plastic wrap. Because they’re made with edible ingredients, I recommend refrigerating the bubbling slime and chocolate slime playdough, just to be on the safe side. See the individual recipes for more information about them. 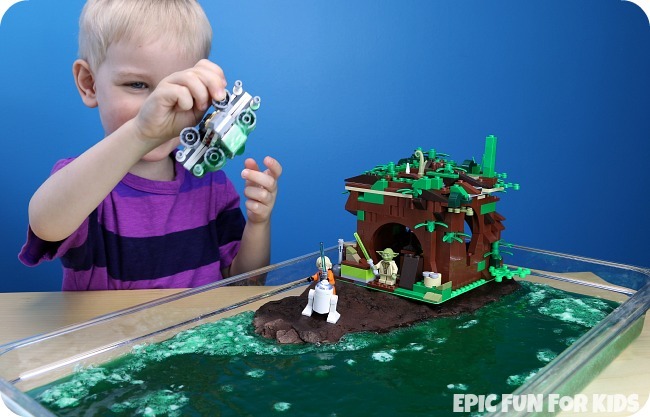 I hope you enjoyed our Lego Star Wars Yoda’s Swamp slime activity! 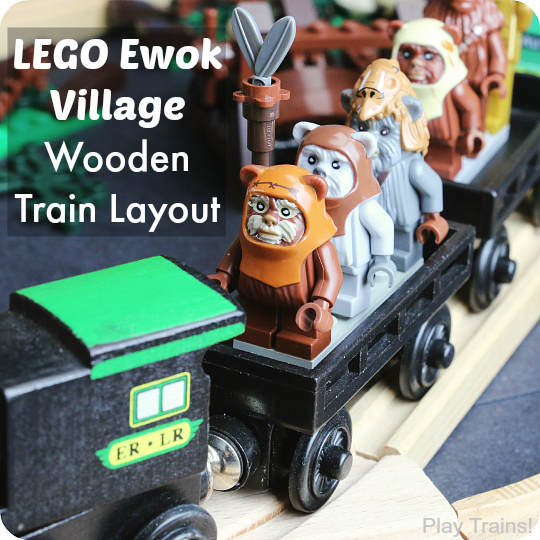 After a year and a half of blogging about train play at Play Trains!, this is our first activity we’re sharing here at Epic Fun for Kids. I hope you’ll follow along with us from the beginning by signing up for our weekly emails. 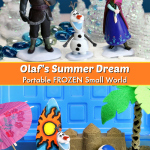 We’ll share our new posts and videos for the week and any other epic kid ideas we have to show you. You can also follow us on Pinterest, Facebook, and Google+ — and don’t forget to subscribe to our new YouTube channel! 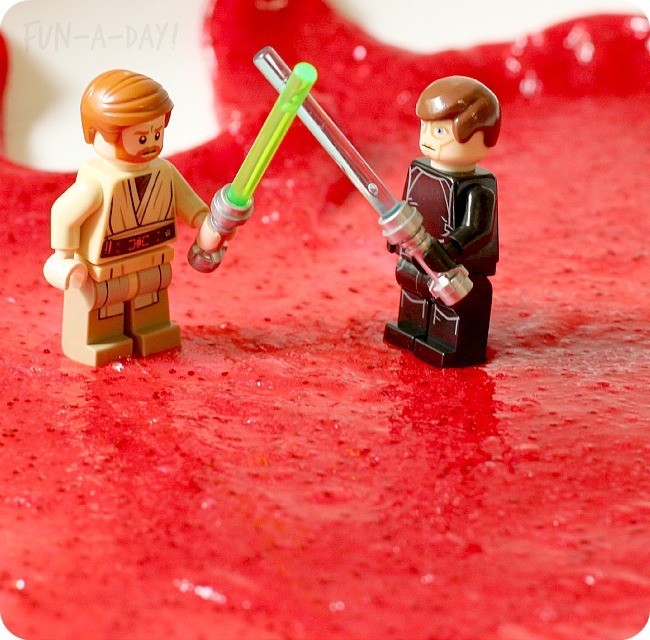 Don’t forget to check out Fun-a-Day’s awesome Lego Star Wars Molten Lava Slime for Kids! We’re so excited to try this out ourselves! 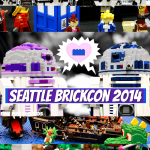 Holy awesome play idea, batman!! I love this idea! My kids are not quite old enough but I can’t wait until they are!!! Maybe I’ll invite my nephews over in the mean time! This is mighty cool. 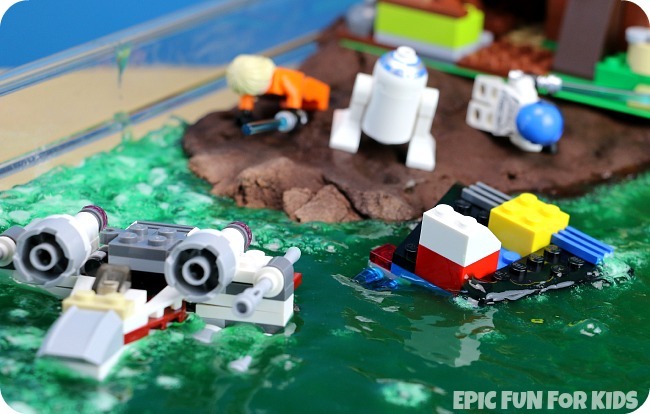 LEGO and Star Wars and green bubbling slime–oh boy! Included in a roundup. Thanks so much for sharing this. Super fun.